I’ve known Nirmal Sen, the owner of Shree Ganesh Handicrafts, ever since I walked into his shop to buy a small purse in 2011. He was so charming and funny that I sat down and stayed a while. Nirmal loves meeting people. Nirmal is so sociable that his shop is a popular stopping place not only for tourists but also for his many friends who frequently drop by to say hello. 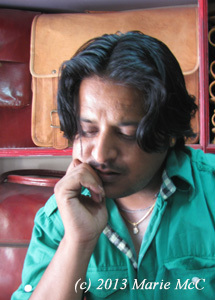 Nirmal has lived in Udaipur all of his life. 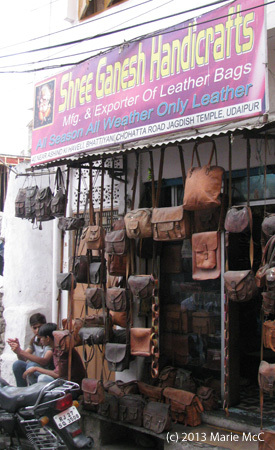 He did not inherit his business but started with next to nothing, selling a few leather bags and journals on the sidewalk. 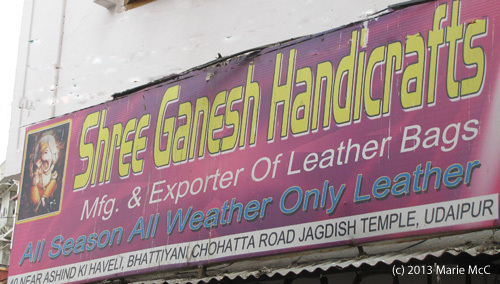 Since 2000, he has owned a shop for sales and export of bags, wallets, briefcases, and many other leather items. Nirmal is honest and extremely hard working. You will always get a good deal here. The shop is open seven days a week year round. Other shops close during the off season when there are few tourists, but not Nirmal’s. 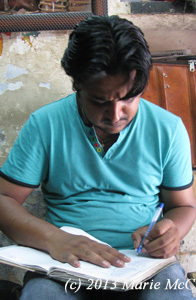 Nirmal works 12 hours a day, rarely taking a day off. Despite his exhausting and busy schedule, he is always cheerful and good humored. “I want to build a future for my family,” he says with a smile. 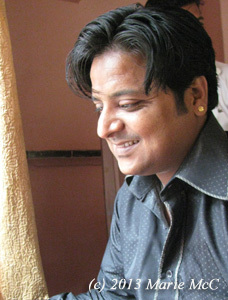 He and his wife Bharti have a son Mohit, born in 2012. Opposite Shivam Cafe near Ashind Ki Haveli. Nirmal’s shop looks great! Definitely we will call in when we come to Udaipur – I love the fact that we already know of hard-working Nirmal and his lovely family from across the other side of the world. Marie, your excellent blog has made this happen!